We can report that the Walmart exclusive Transformers The Last Knight Autobots Unite figures have started to arrive in stores, with the Flip and Change Bumblebee and Hot Rod figures leading the way. Working like the Three Step Changers of Age of Extinction and Robots in Disguise, these are large and simple figures which make the act of transforming a simple and fun gimmick, rather than an involved process. Hopefully this also means the rest of Walmart’s exclusives are on the way. If I recall correctly, Target also used the listing for the AOE One-Step Changer 6-pack again for the RID One-Step Changer 6-pack. That might have something to do with the fact that Series 1 and 2 have the same UPC barcode. And ordering it is the luck of the draw.S1 or 2. Not so much… Series 2 TTC's are out at some Target stores, but Target website only lists Series 1. Odd though that Bumblebee is out in stores but not listed at the website yet, while Hot Rod is in stock at the website but not out in stores yet. Wait,nobody got credit for Hot Rod! I seriously did not know these existed. Thanks. Also, because Walmart's theme for their TLK exclusives isn't just "Hot Rod", but also "Bumblebee/Hot Rod team-up". There's the 1-Step Turbo Changer 2-pack and the Legion 2-pack. Why exactly are these Walmart exclusives? I get Hot Rod, they have a deal on all his toys, but is there a reason Bumble's exclusive too? Because there's no gimmick-specific general retail price point Bumblebee fits in? My face!!!! Not in the face!!! AGAIN!!!! I saw these today. The price tag said $39.99!! Yes, we know there's a Hot Rod coming, he and Bumblebee have been announced by Hasbro, and Hot Rod is in stock at the Walmart website. Well not everyone knows that he's coming, better yet in Walmart stores as of now. Can't trust everything on them websites. Mods post this sighting up in the front page if it's not up. 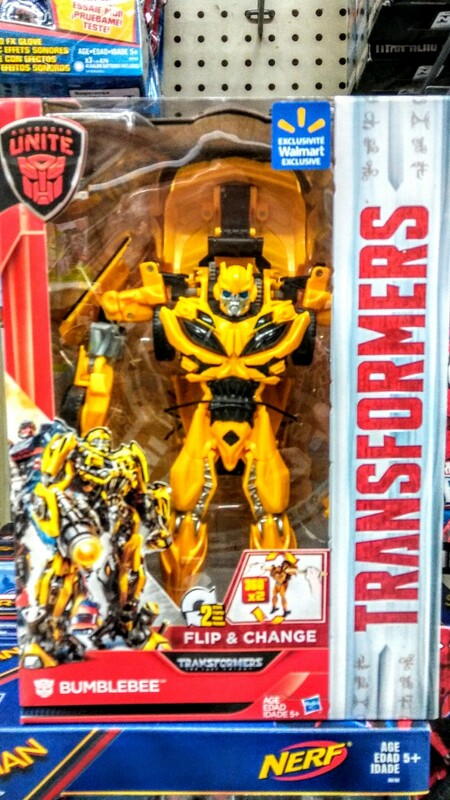 Just spotted the new TLK BUMBLEBEE Flip & Change 2 Step Walmart Exclusive at Walmart in Clinton, MD. It's about $20 and has the "Autobots Unite" logo on it. Looks like there will be a Hot Rod version also since he's on the front package in the lower left and back. Now get your assets to Walmart. Happy Hunting!